I was introduced to a magician by the name of Steve Dobson tonight, by my friend Brian Proctor. He fooled and entertained me for two hours with some amazing magic that seemed to be free of sleight of hand. Not only that...we talked about life and theology over a couple of pints. What a great night! If you've never heard of Steve...here's a link to where you can see his magic, although it doesn't quite capture what I experienced this evening. I have known Steve for a long time. He's great! He's a real worker and it shows. Steve is terrific! If you happen to be near Seattle this evening (specifically, in Renton), you can catch him performing live. 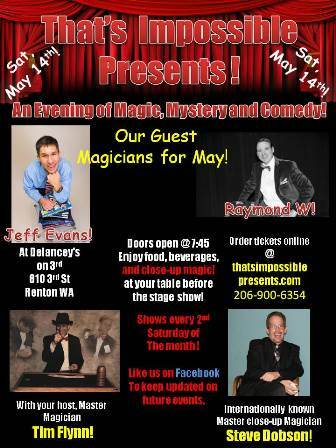 Featuring Steve Dobson, Jeff Evans and Raymond W.
Table magic from 8pm to 9pm. Stand up show begins at 9pm and closes at 10:30pm. Steve is an amazing magician who specializes mostly in card magic. But, that said, anything Steve touches and performs is well thought out, clearly and entertainingly presented...and will fool you badly. On top of that, Steve is a really nice guy, is eminently approachable and is very generous in sharing his knowledge and working with anyone who shows a genuine interest in magic and is not in it merely for learning secrets. He did an incredible trick with dice where the little white dots jumped from one to the other and then wound up fused together. He also showed me some incredible moves that Jerry Andrus came up with. I'd never seen them before but they were brilliant! Steve is the coolest magician I know. He is an even greater friend. My mind goes numb watching his work. He graciously lets me come over to learn. I was blessed that he moved into my neighborhood this last year. Before that I would take Magician's on road trips to visit him in Washington. Her mouth dropped, she said they dated in high school! What are the odds??? Anyway, I will never take our friendship for granted. To me, he is today's Professor. I will agree with Brian as to Steve's gracious and unselfish attitude towards other magicians. He would welcome us into his home at the drop of a hat and spend hours showing and sharing the routines he has perfected over the years. There is no ego to worry about when you hang out with Steve. He is as genuine as it gets. Those of you who are new to magic should do a google search and check out some of Steve's contributions to magic...you wont be disappointed. Steve is a great magician. Also a really great guy. I meet him at a PCAM in Tacoma Wa. He continued to blow people away with his style of impeccable magic. My father was a member of the Tacoma ring, many years ago. He new Steve, when Steve was a young. My father stated that he was incredible back then. What a great and classy person.